When our Chief Adventure Officer Neil asked me to book up a walking trip to Japan recently I think my eyes just about popped out of my head! Here at Macs Adventure we are extremely lucky to get to travel to our wonderful walking destinations to try them out and make sure everything is perfect for our customers and Japan has always been high on my list. So before you could say ‘boo to a goose’ I had my flights booked, my bags packed, and was ready to go! …. the list goes on! All of these fears were very quickly laid to rest however, and my experience in Japan was an incredible one and I am already yearning to go back! The actual walking itself was spectacular and I will touch on this more in a separate blog but I think the below are all aspects of my trip to Japan which had a big impact so really wanted to share my experiences with you. So, let’s start with the first concern – arriving in Japan with limited Japanese and navigating my way from the airport to my hotel. I stepped off the flight and with no hassle at all made my way to the information desk at the airport to buy a 1-day subway ticket for Tokyo. I had been reliably informed that this was the best way to get around Tokyo and that information wasn’t wrong. After taking the monorail from Haneda Airport to Hamamatsucho station (the stops were all announced in English so I didn’t need to worry about getting off at the right place), I did panic slightly when I realised that I took the wrong exit and wasn’t on the street I expected. However, a little bit of polite smiling and pointing with a very friendly local soon had me facing the right direction – it’s amazing how much you can communicate via hand gestures and nodding! Within 10 minutes I had arrived at my lovely hotel in the centre of Tokyo, the Shiba Park Hotel, and after having checked in was armed with my subway pass and ready to explore! I will touch more on public transport in Japan in a later blog but this theme continued throughout my trip. From checking in to Minshuku’s and Ryokan (types of accommodation) where the owners sometimes speak quite limited English, to getting on local buses, to explaining to a village post office that I needed to phone my Ryokan to arrange an earlier transfer this was somehow managed with a combination of smiles, pointing and nodding. I have never in my life experienced such welcoming and friendly people as the Japanese – they will go out of your way to help you with anything and are so accepting and friendly that it actually made me feel quite ashamed and was soon setting resolutions to be a changed person and be nice to everyone in future! 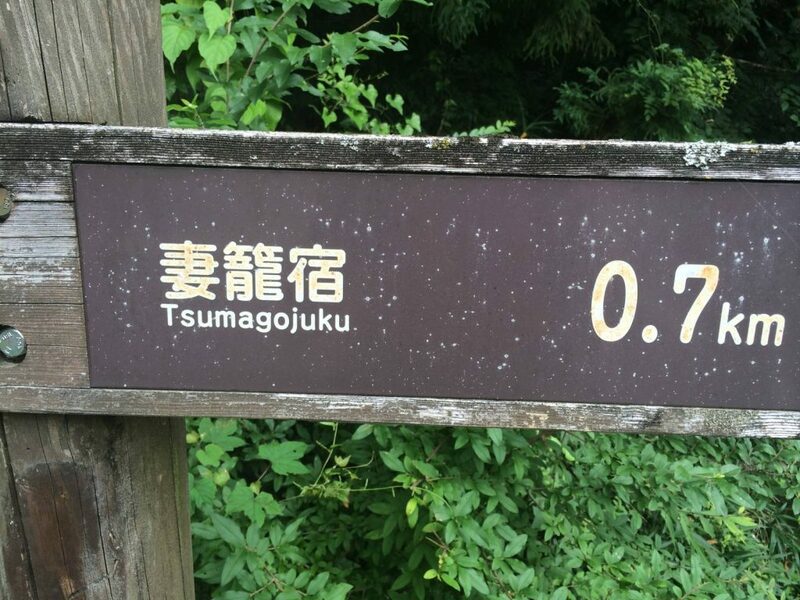 The Nakasendo Trail and the Kumano Kodo are also both extremely well way-marked and the signs are not only written in Japanese but also English so combined with my very comprehensive route notes I had no problems finding my way. My next concern was my stomach! I enjoy my food and was slightly concerned that I would be left hungry as realised the food would be very different to home. What I will say here is that you will enjoy Japan much more if you are open to new taste experiences and I suppose slightly adventurous when it comes to cuisine. The food is absolutely delicious and is a definite highlight of my trip. 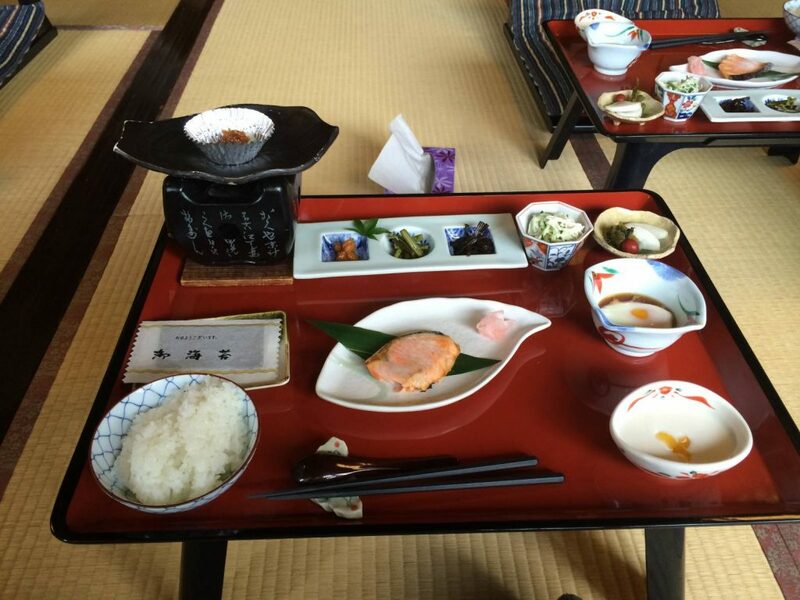 Ryokan and Minshuku place a huge emphasis on their food and it is an important part of any experience at a traditional Japanese accommodation. 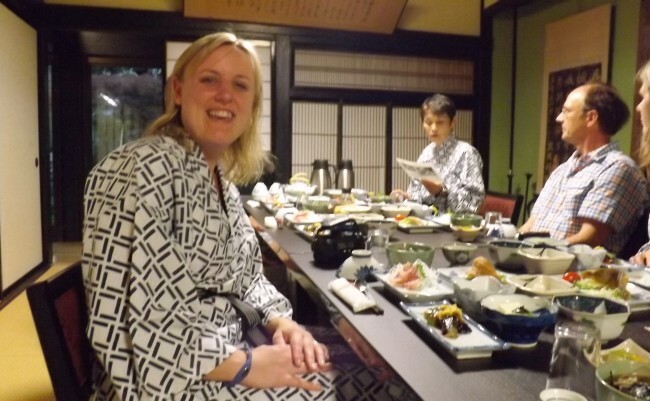 To summarise a typical dining experience at a Minshuku or Ryokan…After arriving, washing and bathing and changing into your Yukata (more on that later!) you are taken into the dining room or dinner is brought to you in your room. You are presented with a series of delightfully tasty, small dishes. Each village, Minshuku, and Ryokan has its own variations and specialities but you can expect combinations of the following – buckwheat noodles, miso soup, grilled fish (mackerel, salmon, ayu to name a few), tofu, eggs, rice, pickles, vegetables and hotpots with beef or chicken, as well as many other tasty options. The dishes are presented to you one after the other until you think you will burst so I had no fear of going hungry! Some of the textures and tastes are slightly unusual so that is the only reason I would say that you do need to be slightly adventurous but I felt like I was dining like a queen every night and don’t think I have ever eaten so well! A couple of the most unusual taste sensations I got to experience were dried grasshoppers and grilled eel – both things which I would never have thought about trying before but both were absolutely delicious! Now, back to Yukata and bathing! 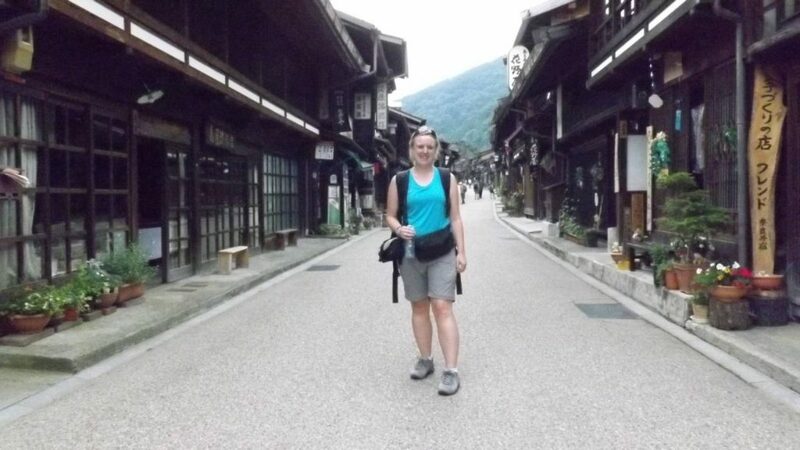 Whilst walking on the Nakasendo Trail and the Kumano Kodo your overnight stops are in small villages where you will stay in traditional Japanese accommodations called Minshuku and Ryokan. The Japanese take their bathing very seriously. So when you arrive at your inn, your Yukata (Japanese robe or dressing-gown) will be laid out waiting for you. You change into this before making your way to the bathing area to wash and enjoy a bath before dinner. There are quite strict rules and etiquette involving Japanese baths and I really didn’t want to make a faux-pas so was quite nervous stepping into the first bathroom. In your room you will find a small towel – take this with you to the bathroom. You will first come to a changing area laid out with wicker baskets where you can leave your clothes, towel and slippers (and may I add your inhibitions?) before stepping into the shower area. Most often the bathing areas are communal (but in some accommodation they do have private bathrooms). You can use the small towel to cover your modesty whilst showering – toiletries like shampoo, conditioner and soap are provided – so you don’t need to bring them. You make sure you are completely clean before stepping into the bath. Make sure you don’t take the small towel with you into the bath and just rest it on your head or on the side of the bath. The idea is that you will be completely clean before you step in the bath and then you get to relax and enjoy the warm waters and soothe those aching bones! There are two types of baths. The more basic tend to be like bathtubs and are made out of cypress wood or the like. 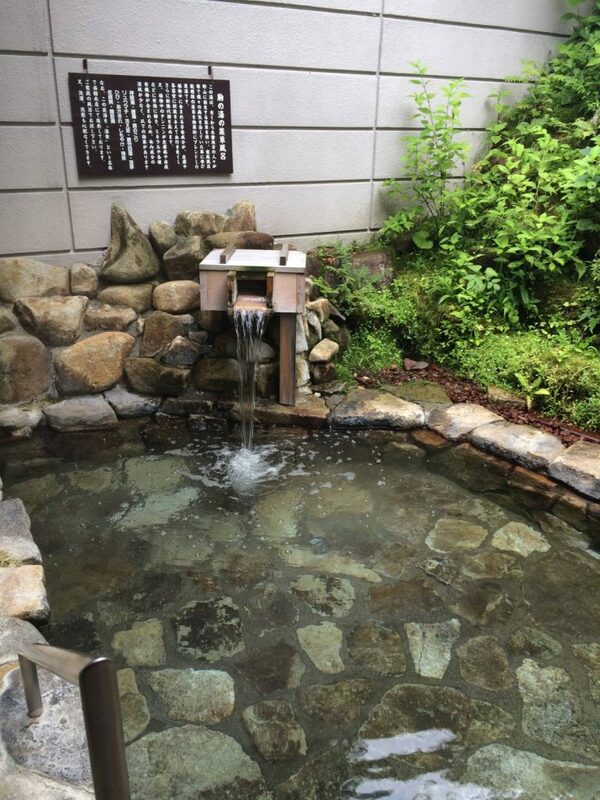 The other type is Japanese Onsen which are natural hot spring baths and one of the most relaxing and delightful experiences I think I have ever encountered! The minerals in the hot springs definitely had healing properties to me and you will step out the bathroom feeling completely refreshed! So once you get over the initial inhibitions then Japanese bathing is a wonderful experience and extremely relaxing! If you would like to read more about the actual walks then you can read my other posts, but I would say that everything I was nervous about before going to Japan was very quickly alleviated with the help of the wonderfully welcoming Japanese people. Whilst Japan does offer an off-the-beaten-path walking destination, it is one where you will almost immediately be made to feel at home! You can visit our website for more information about walking holidays in Japan, and should you have any other questions please get in touch by emailing [email protected] and a member of our team will get back to you as soon as possible. I am never happier than when out on the road discovering new places and meeting new people. I have been lucky enough to work in every area of Macs Adventure from our UK team, to Europe and now Worldwide. 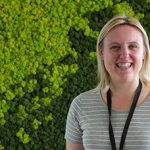 I love helping people discover new places - whether that be the beautiful and rugged south coast of England, the gelato bars and cliff top paths of the Amalif Coast or the beautiful mountains and countryside of the Kumano Kodo Trail in Japan!